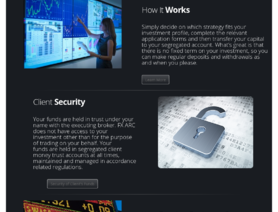 I have been invested in a FXarc MAM account for 10 months now. My account is with IC Markets and I have had a very positive experience. After commissions I am standing on a 50% return on my capital and have never been in negative territory with my invested money. Drawdown is well managed with tight stop losses. There have been negative months so this is not for a short term investor, but I can recommend for investors that want to invest over a longer period of time.